In conventional cooking using a pan on the stove, the oven, or a barbecue grill, the cooking time is the main variable you have to decide upon. We all know easy rules like bake a turkey for 20 minutes per pound. And even though such methods are not fool proof, we feel comfortable because we have grown up seeing others cook that way. Sous-vide is quite new, and it provides less visual and tactual clues to what is going on. With conventional cooking it is easier to see or feel if the food is cooked to your liking. With sous-vide cooking it is not just about time, but also about temperature. It allows you to achieve a much higher level of precision, but this also means that you have higher expectations. Since you have two variables (time and temperature) to consider, it takes a longer time to gain experience. In this article I will explain how you can confidently choose the time and temperature to cook meat sous-vide. This will hopefully shorten your learning curve. Is it a tender cut of meat or a tough cut of meat? A tough cut of meat will require additional time and/or a higher temperature to become tender. How tender do you like it? More time in the meat jacuzzi will make the meat more tender. But leave it in too long, and it will become mushy. How thick is it (and what shape does it have)? The time it takes for the core of the food to reach the desired temperature in a sous-vide depends on the thickness, not on the weight. If it is twice as thick, it will take four times as long to heat all the way through. How ‘done’ would you like it? This is only a matter of temperature: 55C/131F for medium rare (‘red’), 60C/140F for medium (‘pink’), 65C/149F for medium well, 70C/158F or above for well done. Once the meat has reached a certain temperature (and thus doneness) there is not much use to continue cooking it at a lower temperature. This is similar to eggs: once it is hardboiled, you can’t turn it into a softboiled egg anymore. Does it need to be pasteurized? This is a requirement for poultry, ground meat, and wild game. For beef, lamb, or pork, it is only a requirement if you are feeding people with a compromised immune system (like elderly) or pregnant women. To pasteurize you will need to add more time. How much, depends on the cooking temperature. Pasteurization can be achieved at temperatures of 52C/126F and up, but it will take about 5 hours at such low temperatures. Click here for more information about food safety. Is the meat frozen or refrigerated? If frozen, you can cook it directly from frozen and that will be faster than allowing it to thaw first, but you need to add additional time (30 minutes for 2.5 cm/1 inch thickness, 2 hours for 5 cm/2 inch thickness). The guidelines below take all of these factors into account. Because it is tender and does not need to be pasteurized, you only need to put it in the sous-vide long enough for the core temperature to reach the desired doneness. (But you do need to sear it before or after sous-vide cooking to kill any pathogens that may be on the outside of the meat.) This means that the temperature is determined by how ‘done’ you would like it, and the time by the thickness and shape. This also means that for this type of meat, it does not make sense to ‘cook’ it sous-vide and then chill (and possibly freeze), because reheating is the same as cooking! For the time you need to realize that if you put cold meat in the warm water of a sous-vide, it will take time for the heat to diffuse into the meat. It depends on the thickness and shape how long this will take. The graph above shows a typical pattern of how the core temperature of a piece of meat inside a sous-vide at 55C rises (temperature in Celcius on the vertical axis, time in minutes on the horizontal axis). As you can see, the temperature rises more quickly at first, because then the difference between the cold meat and the warm water is larger, and thus the heat diffusion is stronger. When the core of the meat has almost reached the temperature of the water, the core temperature rises only slowly. In the graph you can see that after 30 minutes it is already at 52 degrees, but it will take more than an hour to get above 54. This is good to keep in mind when you are reheating food sous-vide, because then it doesn’t matter if it doesn’t heat up all the way. 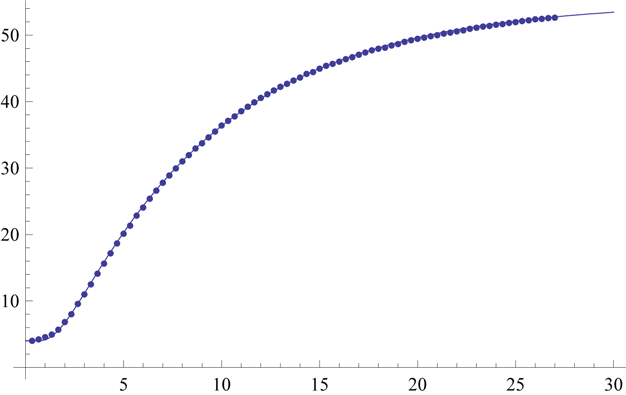 Another thing to keep in mind is that the heating time is a quadratic function of the thickness. That means if the meat is twice as thick, it will take four times as long to heat it through. For instance a slab of 2.5 cm (1″) will take 35 minutes to heat through, and a slab of 5 cm (2″) will take four times as long, 2 hours and 20 minutes. 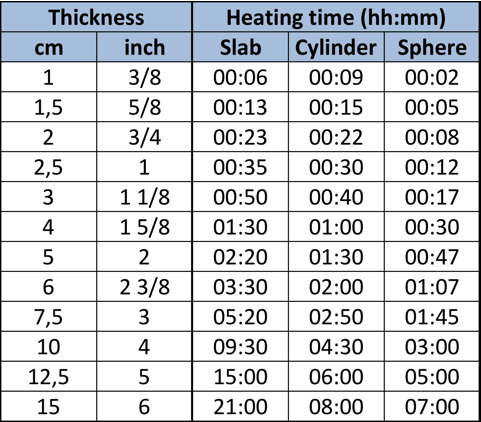 The thermal diffusion mathematics to calculate how much time it will take for the core of the food to get close to the water temperature are quite complicated, so it is best to use a chart for this purpose, such as the one below. I’ve adapted this chart from the huge tables in Modernist Cuisine. The time depends on the thickness and the shape: slab (like a steak), cylinder (like a sausage) or sphere (like a ball or cube). The times are starting from refrigerated meat. Frozen will take longer. You may note that these times are shorter than in some other sources. That is because Modernist Cuisine has calculated the time needed to reach a temperature of 1C/2F below the temperature of the water, rather than 0.5C/1F as some other sources, and I have used the heating times from refrigerator temperature to 60C/140F rather than 80C/175F. Together that makes quite a difference. 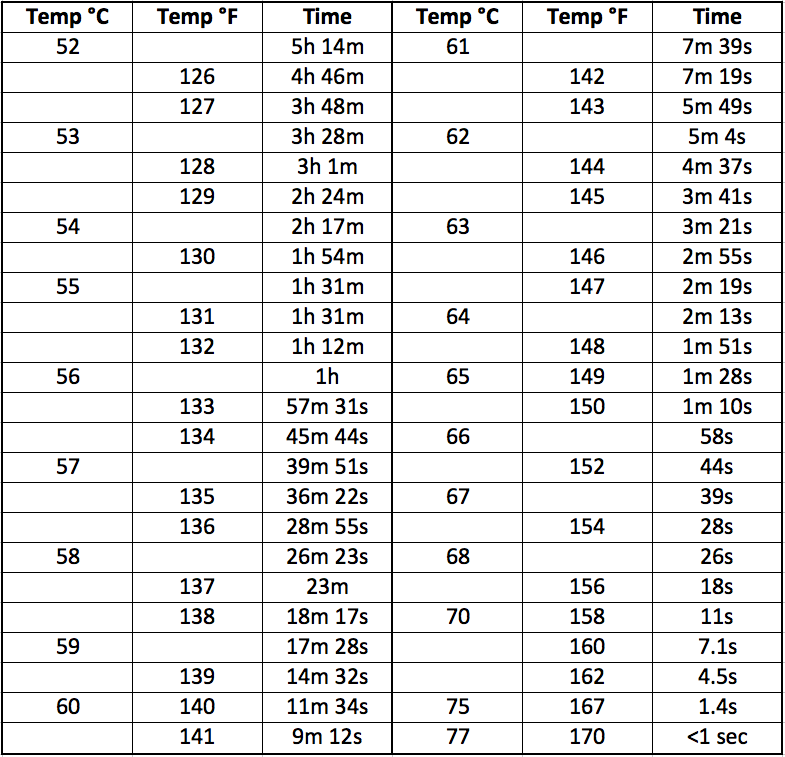 If you put the meat in the water for a shorter time than indicated in this table, then the core of the meat will be cooler than 1C/2F below the water temperature and the meat may not be already as done as you wanted it to be. If you leave it in longer, the meat will slowly become more tender. This tenderizing happens more quickly at 60C/140F than at 55C/131F. You can usually leave it in for hours before it becomes too tender (mushy). For very tender types of meat like tenderloin additional tenderization is not beneficial, but I like to give rack of lamb or ribeye steak a few hours extra to make it more tender. If there is a risk that the meat has been contaminated with pathogens, it should be pasteurized. This means that after heating all the way through, it should be kept longer at that temperature for pasteurization to occur. This risk is generally present with poultry and wild game, or with ground meat. The most common examples for tender poultry are chicken breast, turkey breast and duck breast. My preferred temperatures are 60C/140F for chicken breast, 56C/133F for turkey breast, and 55C/131F for duck breast. I like to keep duck breast a bit longer than needed to heat through and pasteurize, to tenderize it a bit more. With sous-vide you can cook a hamburger medium rare (pink inside) and still pasteurize it, so it will be safe to eat. Burgers are great cooked sous-vide at 55C/131F and then finished on a very hot grill. For wild game the best temperature for tender meat is usually between 53C/127F and 55C/131F. Examples are venison loin, pigeon breast, pheasant breast, partridge breast. To find the total cooking time, add the pasteurization time to the time to heat through from the previous table (this is a conservative approach, as pasteurization starts already as soon as parts of the meat reach a temperature of 52C/126F or higher). Taking into account that the heating time is for 1C/2F less than the sous-vide temperature, you should use the pasteurization time for 1C/2F lower than the sous-vide temperature. As mentioned before, it is fine to keep it in the sous vide some hours longer than the time indicated. Only after a lot more time the meat will become too tender. Tough meat has a lot of connective tissue and is traditionally used in stews and braises. With sous-vide you can choose whether you’d like to turn tough meat into something with the texture of a medium rare steak, or if you’d like a stewed/braised/pulled texture (see the next section). To cook tough meat such that will become tender but still be medium rare or medium is something that is only possible with sous-vide. The advantage is that the meat will be more flavorful and less expensive than buying tender meat. It can take a long time in the sous-vide, but as meat does not require any attention while it sits in the sous-vide that is not really an issue. It just requires some planning, and you can cook it in advance and then refrigerate or freeze it, and then reheat when needed (for reheating times, see the instructions for tender meat). Because the cooking times are so long, the meat is always pasteurized. The cooking times are not very precise, a couple of hours more or less does not make a lot of difference. This also means that the size (thickness) doesn’t matter (unless it is a huge roast that requires very long to come to temperature). You can increase the temperature to shorten the cooking time and make the texture even more flaky, but at the cost of the loss of juices. Beef chuck can then be done in 5 hours at 88C/190F for example, but I prefer 24 hours at 74C/165F. The exception is duck confit, for which I prefer 8 hours at 82C/180F to obtain the traditional texture. To make up for the loss of juices, some melted duck fat is mixed with the strands of meat. Because the cooking times are so long, the meat is always pasteurized. The cooking times are not very precise, a couple of hours more or less does not make a lot of difference. This also means that the size (thickness) doesn’t matter. 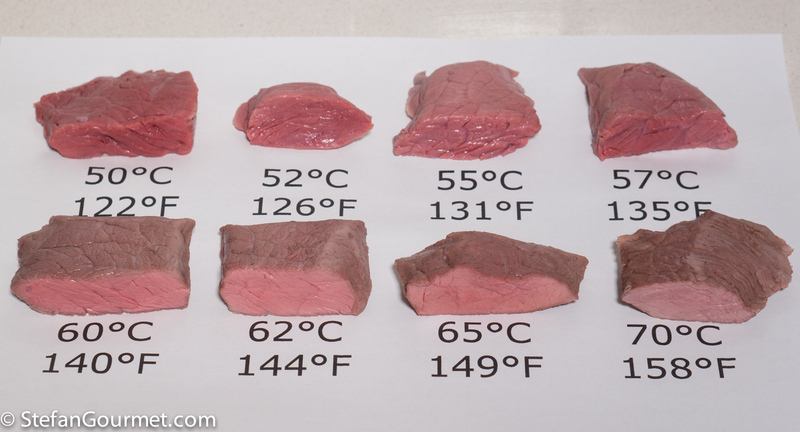 If you cooked some type of meat sous-vide and you are not happy with the result, this is how you adjust the cooking time or temperature the next time you prepare that same type of meat. First double-check whether the cooking time was appropriate for the thickness of the meat, using the table above. Otherwise you might come to the wrong conclusion. If the meat is too tough or chewy, next time increase the time. Increase it a bit if it is slightly chewy, or increase it by a lot if still very tough. If the meat is too soft or mushy, next time decrease the time. Decrease by a bit if it is a bit too soft, or by a lot if it is mushy. If the meat is less done (too red/bloody) than you prefer, next time increase the temperature. If the meat is more done (too grey) than you prefer, next time decrease the temperature. I recommend to change only variable at a time, as otherwise you won’t know what made the difference. For further reading, check out these blogs about juiciness, tenderness, and succulence, appearance, and flavor of meat. Wow, this is an impressive resource you’ve created Stefan. Thanks so much for sharing your knowledge on Sous-Vide with all of us. It’s obvious that you’re totally rewarded with tender, melt-in-the-mouth meat for having a little extra patience with the cooking time. Thanks, Margot. Do you use sous-vide? I haven’t so far Stefan, but it’s something I’d like to explore in the next year or two… that’s if I can find room in the kitchen for yet another appliance! Regardless, I’m always fascinated to read about different cooking techniques and the benefits from using them. Great that you’re so passionate about cooking sous-vide! Wow!! 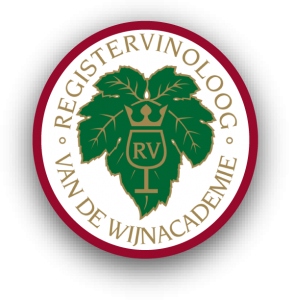 Easter Wish: that all of us who congregate around your blog could sit side-by-side in you kitchen and you could teach us the ‘modern’ methodology in real life with all of us madly taking notes! You might even convert me to sous-vide 🙂 ! We’d cook for afters and bring the wine! Hope you are having a happy break!!! Wow, lots of useful info, Stefan! Such a timely and excellent resource, Stefan. I’m pleased you dealt with the issue of ‘tough meat’ and also duck confit. I wish I had had this a few weeks ago when I attempted (a fail) a 135F 12 hr duck confit that turned out like liver. I think a next step would be a spreadsheet or app in which one could input the variables of weight, thickness, cut and be returned a temperature and time. This may be a project I might work on once I get more comfortable with my sous vide machine. The science of meat is truly amazing. Even after many years, I still feel I am just starting the journey. Thanks, Stefan, for an outstanding resource to which I return often as I gain experience in sous-vide cooking. You always provide a solid point of departure. Very best wishes, Ed. Thank you very much. It is feedback like this that keeps me going. Happy holidays! Dear Stefan, thanks a lot for your contributions. I red more of them. They are well logically written and explained. Your methods look to be very scientific. You are really researcher in cooking, I am in chemistry 🙂 I was looking long time for a method that will keep the best quality of cooked meat. I guess this is exactly, what I was looking for. Next Next post: Pork Loin or Tenderloin Sous-Vide: To Brine or Not To Brine?